This is the second edition of the Warhammer 40,000 wargame, published in the form of a large boxed set containing plastic models for Space Marine and Ork armies, card ruins, a wide variety of components, and several books. The Rulebook gives the core rules for gameplay, the Wargear book has rules for equipment, the Codex Imperialis contains army lists for all existing forces at the time, and a Scenario booklet gives a range of scenarios. 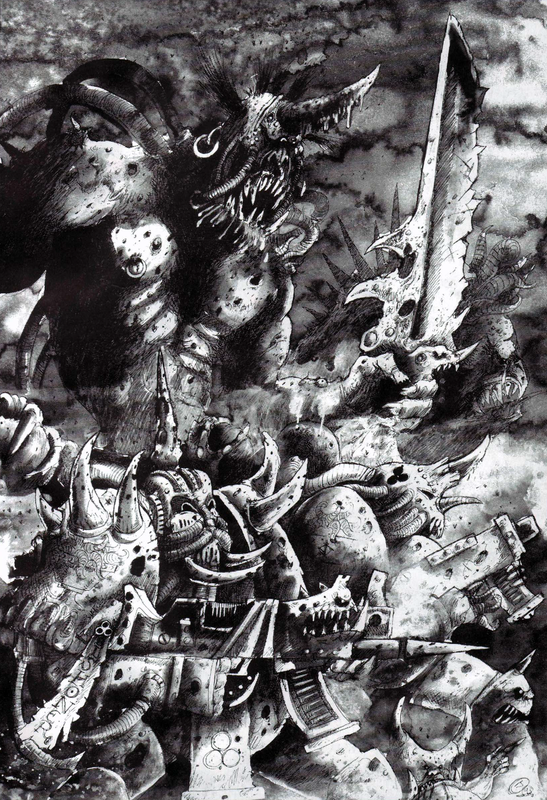 The main Rulebook includes an extensive colour 'Eavy Metal section, including (on p55) a Nurgle Plague Marine model. Of creations most foul I beheld the Lord of All and knew that I was dead. Even the most battle hardened of the Ordo Malleus dread this foul daemon more than any other. 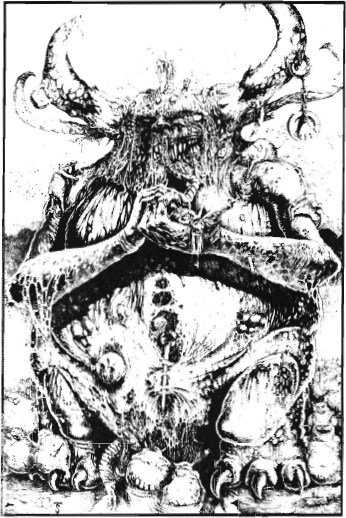 It is the very image of the Plague God Nurgle himself - huge, green-skinned and bloated with corruption. From open sores and swelling boils, pus and slime dribble over the daemon's leprous skin. Decaying inner organs protrude from rents in rancid flesh. From its gaping maw trickles a bubbling stream of vomit mixed with blood, maggots, and other foulness. All the special rules for daemons apply as described earlier. In particular, note that the Great Unclean One has a daemonic aura which gives it a saving throw of 4+. Terror. The Great Unclean One is the most foul of all daemons, its horrific bloated appearance is an offence to the world. Those who witness it rarely survive with their reason intact. The psychology rules for terrror apply as described in the Warhammer 40,000 Rulebook. Remember that creatures which cause terror automatically cause fear as well. Stream of Corruption. The Great Unclean One can unleash a stream of steaming vomit over its enemies. This is worked out during the shooting phase. Use the teardrop-shaped flamer template to represent the attack and calculate casualties exactly as you would for an attack from a template weapon. The stream of vomit inflicts a S7 attack on targets it hits. Fear. Nurglings spill over their victims like an irrepressible tide of foulness that is an assault to mind and body alike. 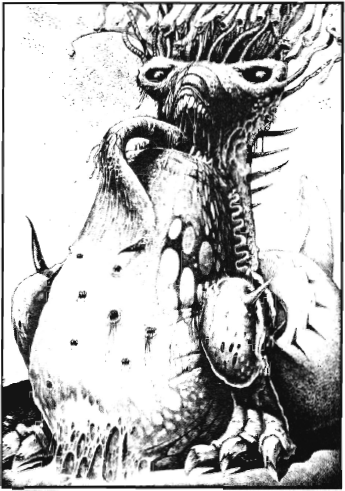 Nurglings cause fear as described in the main Rulebook. Fear. The monstrous appearance of the Beast of Nurgle is as nothing compared to the stench of its foulness. The Beast causes fear as described in the Warhammer 40,000 Rulebook. Attacks. The Beast of Nurgle has D6 attacks in hand-to-hand combat from its tentacles. This is determined every combat round. The slime automatically penetrates any armour that the victim has, so no armour saving throw is permitted for models wounded by the Beast. Slime Trail. As the Beast moves it leaves a slime trail behind it. This makes it impossible for a large number of foes to attack the Beast without becoming caught up in the slime trail. To represent this factor, multiple attackers do not receive the usual bonuses when attacking the Beast: they do not receive the +1 extra attack for each opponent after the first, nor the +1 close combat modifier for each opponent after the first. Although we divide Chaos Space Marine characters into Champions, Heroes and Mighty Heroes for convenience, all of these characters are termed Chaos Champions. Chaos Champions are the favoured servants of their masters, the Gods of Chaos, and their complete devotion is rewarded with numerous gifts of power. As a Champion gains favour in the eyes of his Chaos God so he becomes more powerful. There is a terrible price to pay, for the Gods of Chaos are whimsical and uncarign creatures, whose gifts often bring gross physical mutation and deformity. Horns, wildly discoloured flesh, distorted limbs, cloven hoofs and other, stranger, mutations are all too common amongst the Champions of Chaos who bravely bear their disfigurements as symbols of their divine favour. Champions of Nurgle are swollen with corruption, their armour barely containing their bloated bodies. Because their bodies are dulled with disease and partly rotted away they feel little pain and can endure considerable injury without discomfort. A Chaos Champion of Nurgle always adds an extra +1 to his Toughness on account of his hugely bloated body.